Brandon Lee (1 February 1965 – 31 March 1993) was an American actor and martial artist. 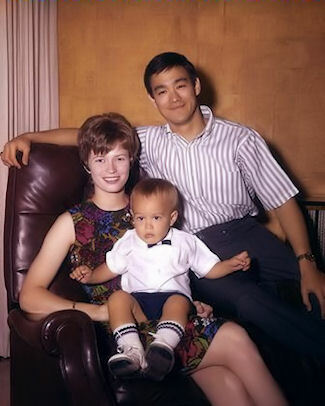 He was the son of martial arts film actor and teacher Bruce Lee and Linda Lee Cadwell, the grandson of Cantonese opera singer Lee Hoi-chuen, and brother of Shannon Lee. Starting his career with a supporting role in the 1986 television film Kung Fu: The Movie, Lee starred in several low-budget action films during the late 1980s and early 1990s. He died in a firearms accident while filming his fifth film, the supernatural action film The Crow, in 1993. The film was released posthumously in 1994 with the help of a stunt double and special effects. In 1985 he worked for Ruddy Morgan Productions as a script reader, doing an uncredited cameo in the action film Crime Killer (1985) starring George Pan Andreas. He was asked to audition for a role by casting director Lyn Stalmaster and got his first credited acting role in Kung Fu: The Movie, a feature-length television movie which was a follow-up to the 1970s television series Kung Fu. The film aired on ABC on 1 February 1986 which was also Lee's 21st birthday. In Kung Fu: The Movie, Lee played Chung Wang, the suspected son of Kwai Chang Caine (David Carradine). Lee's real life father was originally considered to play the leading role in the Kung Fu TV series. Lee got his first leading film role later that year in the Hong Kong action crime thriller Legacy of Rage in which he starred alongside Michael Wong, Regina Kent and Mang Hoi (Look-alike of film star Yuen Biao). It also featured a cameo appearance by Bolo Yeung who appeared in his father's film, Enter the Dragon. Made in Cantonese and directed by Ronny Yu, it was the only film Lee made in Hong Kong. He was also nominated for a Hong Kong Film Award for Best New Performer in this role. In 1987, Lee starred in the unsold television pilot Kung Fu: The Next Generation which aired on CBS Summer Playhouse and was another follow-up to the Kung Fu TV series. In this film the story moved to the present day, and centered on the story of Johnny Caine (Lee), the great-grandson of Kwai Chang Caine (David Carradine). In 1988, Lee made a guest appearance alongside Pat Morita in an episode of the short-lived American television series Ohara playing a villainous character named Kenji. In the summer of 1988, Lee also started filming his first English-language B-grade action film, Laser Mission; it was filmed cheaply in South Africa, and was eventually released on the European market in 1990. In 1991, he starred opposite Dolph Lundgren in the buddy cop action film Showdown in Little Tokyo. This was marked as his first studio film and American film debut. Lee signed a multi-picture deal with 20th Century Fox in 1991. He had his first starring role in the action thriller Rapid Fire in 1992, and was scheduled to do two more films for them. The bulk of Brandon Lee's martial arts instruction came from his father's top students, and best friends Dan Inosanto and Richard Bustillo. Well, I would say this: when you move down the road towards mastery of the martial arts and you know, you are constantly moving down that road you end up coming up against these barriers inside yourself that will attempt to stop you from continuing to pursue the mastery of the martial arts. And these barriers are such things as when you come up against your own limitations, when you come up against the limitations of your will, your ability, your natural ability, your courage, how you deal with success—and failure as well, for that matter. And as you overcome each one of these barriers, you end up learning something about yourself. And sometimes, the things you learn about yourself can, to the individual, seem to convey a certain spiritual sense along with them. ...It's funny, every time you come up against a true barrier to your progress, you are a child again. And it's a very interesting experience to be reduced, once again, to the level of knowing nothing about what you're doing. I think there's a lot of room for learning and growth when that happens if you face it head on and don't choose to say, "Ah, screw that! I'm going to do something else!" We reduce ourselves at a certain point in our lives to kind of solely pursuing things that we already know how to do. You know, because you don't want to have that experience of not knowing what you're doing and being an amateur again. And I think that's rather unfortunate. It's so much more interesting and usually illuminating to put yourself in a situation where you don't know what's going to happen, than to do something again that you already know essentially what the outcome will be within three or four points either way. Brandon Lee died of a gunshot wound on 31 March 31 1993 at the filming studio in Wilmington, North Carolina, at the age of 28, after an accidental shooting on set of The Crow.